Have you ever not put something out there because it wasn’t perfect? Maybe you know that it will be better, more refined, or better speak to your audience after you take a class, learn more, or spend more time working on it. I found myself thinking about this with the Unnamed Productivity Club last month. And next time I open the doors to it the sales page probably will look a little different, I will have completed that course, and how I talk about it might change slightly. But that didn’t mean that I needed to wait. I think this is something that happens a lot in our businesses. You know that in a couple months the service or product you offer (or the way you talk about it) will be better. So, you want to wait until you’re in that spot before you share or promote or sell. The problem is that this is always true. In a couple months, you’ll have made those changes/improvements, but you’ll see new areas for improvement, new reasons to wait. But that doesn’t mean that you should wait. The person out there doing things imperfectly is always making more progress than the person trying to make things perfect before they share them. So, where are you with this? 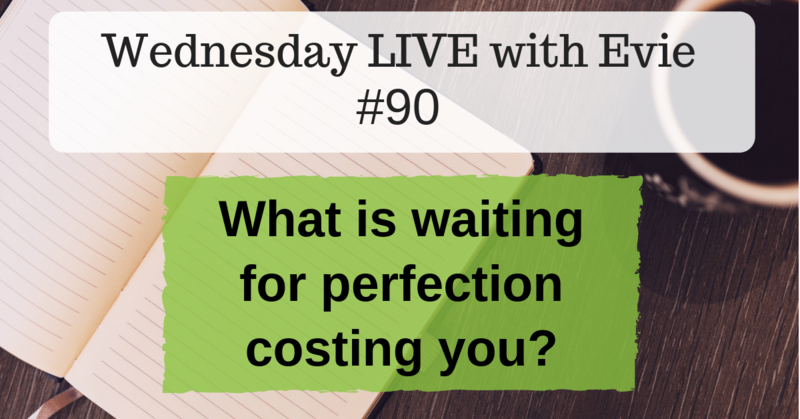 Are you waiting until you achieve perfection before you share or are you out there sharing? I’ll talk more about this in the video below.